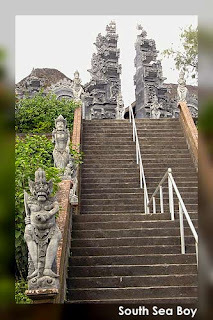 Pura Puncak Penulisan is located 1745 from the sea about 3 km from Kintamani or 30 km from the capital city of Bangli, on the east side of the road part of Denpasar - Singaraja. Based on Bali ejection ancient writing is said that Hill is also called the Bukit Tunggal because they stay separate from the chain of mountains stretching from west to east, as if Bali divide into two parts: North and South. Around the 9th century on the summit of Mount Temple was built Writing Tegeh Koripan better known as the Pura Pucak Writing because it is located at the top of Puncak Penulisan. Pura Pucak Penulisan is located on top of the hill, made up of several terraces until eleven terrace. Terraces was intended as a continuation of the cultural aspects of megalithic age pyramid. It is also a complex and Pura Pura Danu Danu Park is located on a terrace to -3, also there are Temple Queen Penyarikan located on a terrace to-4 in the western part of the temple. The fourth complex, is the Queen Daha Temple is located in the Old West at 16th Terrace. History of Pura Pucak Penulisan. Writing temple complex is the entity that built the bronze era, which began at about the year 300 BC. And further to the first millennium AD, namely the 10th century until the end of the power of Majapahit in 1343, this area is dominated by the Kingdom of Pejeng-Bedulu. King makes the rules written on the outskirts of bronze, which proved that men of letters have been received to reconstruct the history of the Kingdom. Many papers that use the basics of Hinduism and Buddhism which contains the basic legal rules. A). Inscription Writing I: Figures for the Year 1011 AD (Caka 933) and its King, mpu BGA Anatah. B). Indrakila Inscription from Temple Hill (near the village of Kintamani) with numbers in 1016 AD (Caka 938) says people arcanigayan (The origin of Caningan Village, near the village of Dausa in Kintamani) requested the Subsidiary Wungsu their king, attended the memorial ceremony to be held by his wife , Bhatari Sterile. Community Sukawana grant their request. C). Inscription Writing V: Figures for the Year 1332 Maswhi (Caka 1254) read ............ t (asu), Ra Rachael King Bhumi or Sura Asta Ratna Sri Bhumi Banten. Rachael King Bhumi Sri Asta Sura Bali Banten was the last king who ordered during the expedition Gajah Mada (1343), which is famous in the 14th century Majapahit Kingdom is a Patih who dreams of uniting the nation. With the inscription of the Temple Writing conclude that we can know that by the year 1016 AD the temple is used as a place of thanksgiving for the last wife of King Children Wungsu. Continuing as a "mountain sanctury" from the kingdom Pejeng-Bedulu of the 10th century until the expansion of Majapahit in 1343, only Pura Besakih made as "mountain sanctury" for Dynasty Gelgel in Klukung (15th century - 17).